Take the Piccadilly tube line direction east, to the last stop. Cockfosters. (or the 2nd to last stop Oakwood). Explore the 169ha Trent Park. In the 14th century it was part of Enfield chase, a woodland and royal deer park, and a favoured hunting ground of Henry IV. Prior to this it had been an enormous woodland forest. In 1777 it was divided between various authorites. The area that became Trent Park was given to Dr Richard Jebb by George the III as a reward for saving the life of his brother the Duke of Gloucester at Trento. During the second world war the park was used as a prison for German generals and staff officers. Given special treatment including rations of whisky, walks in the park and rooms with hidden microphones giving the British military much useful information. Today it is a public park and campus for Middlesex University. 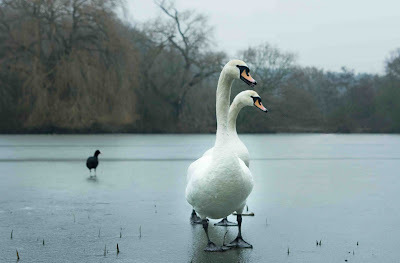 The graceful dance on stage was not repeated by these akward and far from graceful swans on the frozen lake yesterday. Very nice title. It looks like the ducks and geese can walk on water. OHHH all dressed up and nowhere to go. I thought of swan lake even before reading your title. They might not be so gracious as as dancer on stage but they are definetely sweet. Another lovely photo, Mo! Ciao. A.
thanks for the directions and history - I'll have to add this park to the must-sees on my next trip. ok- thanks for the tip I will for sure get out to trent park, handy! Very fine compostion, Mo. "Louis" loves the symmetry! Nice catch -- they are such different birds out of the water. It is so interesting to read of the many lives this patch of ground has had. Many more to come, one hopes. This is a great photo. I am enjoying your blog.